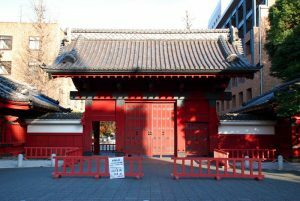 The University of Tokyo (東京大学), abbreviated as Todai (東大) , is a research university located in Bunkyo, Tokyo, Japan. The university has 10 faculties with a total of around 30,000 students, 2,100 of whom are foreign. Its five campuses are in Hongō, Komaba, Kashiwa, Shirokane and Nakano. It is the first of Japan’s National Seven Universities. The university was chartered by the Meiji government in 1877 under its current name by amalgamating older government schools for medicine and Western learning. It was renamed “the Imperial University (帝國大學)” in 1886, and then Tokyo Imperial University (東京帝國大學)in 1897 when the Imperial University system was created. In September 1923, an earthquake and the following fires destroyed about 700,000 volumes of the Imperial University Library. The books lost included the Hoshino Library,a collection of about 10,000 books.The books were the former possessions of Hoshino Hisashi before becoming part of the library of the university and were mainly about Chinese philosophy and history. In 1947, after Japan’s defeat in World War II, it re-assumed its original name. With the start of the new university system in 1949, Todai swallowed up the former First Higher School (today’s Komaba campus) and the former Tokyo Higher School, which thenceforth assumed the duty of teaching first- and second-year undergraduates, while the faculties on Hongo main campus took care of third- and fourth-year students. Although the university was founded during the Meiji period, it has earlier roots in the Astronomy Agency,Shoheizaka Study Office, and the Western Books Translation Agency.These institutions were government offices established by the Tokugawa shogunate (1603–1867), and played an important role in the importation and translation of books from Europe.